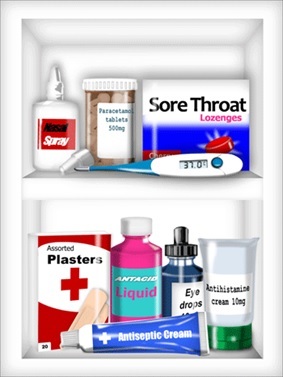 Here is a list of useful medicines and dressings with a description of their uses. All are quite cheap and worth stocking at home in readiness for minor illnesses.Keep them in a box or cupboard with a lock – or store them well out of the reach of children. Good for headaches, colds, sore throats and painful bruises. For sprains, strains and backache.